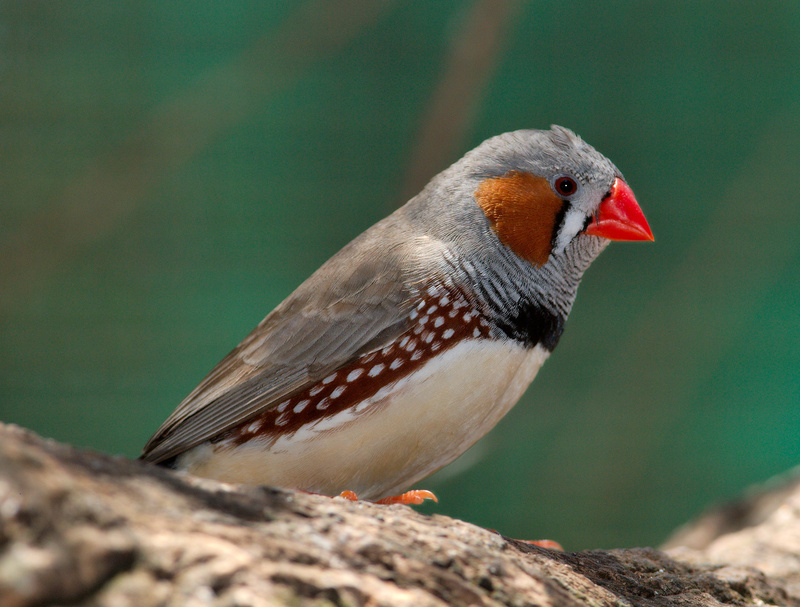 Songbirds have evolved special areas in the brain that are used for song learning and song production. Two types of output connections from a cortical area known as HVC (proper name) each go to two ‘separate’ pathways. Some HVC neurons connect directly with neurons in a brain area called RA (robust nucleus of the archopallium), which in turn connects with the motoneurons that control the muscles in the vocal control organ (syrinx). Another set of HVC neurons connect through what is called the anterior forebrain pathway, a collection of cortical, thalamic and basal ganglia nuclei that are important for birds to learn their song. The two pathways talk to each other through a nucleus called LMAN that sends a direct input to RA. The anterior forebrain pathway sends an error signal through the connections from LMAN to RA to ultimately control the motoneurons in nXIIts to produce the desired song structure. What is puzzling about the circuit is how the precise timing for this to operate efficiently is achieved. 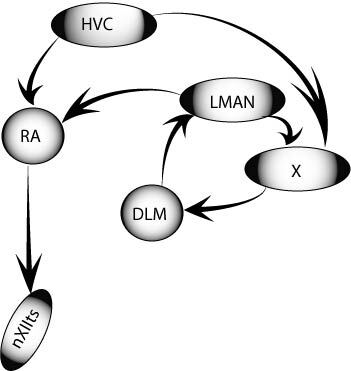 Because it takes time for the action potential to travel down the axon, and because it takes time for information to travel through synapses, the anterior forebrain pathway roundabout way (HVC-to-X-to-DLM-to-LMAN-to-RA) should be much slower than the speed of travel of information from HVC to RA. And this is precisely what Arthur Leblois, Agnes Bodor, Abigail Person and David Perkel examined. To determine this, they electrically stimulated HVC and recorded from area X, DLM and LMAN, and were able to explore the mechanisms by which information travels around the anterior forebrain pathway as well as how long it takes to get from one point to another (latency). How is transmission routed along the anterior forebrain pathway? What they found is that low intensity stimulation from HVC produces excitation of area X neurons, but that higher intensity stimulation also produces a rapid inhibitory input from local area X circuits. One of the effects of this early inhibition is a lengthening of the time interval between consecutive action potentials in the neurons in area X that project to DLM (pallidal neurons). DLM is normally inhibited by pallidal neurons in area X. But if the time interval between action potentials in the pallidal neurons is increased, it releases the ‘veto’ signal on DLM neurons which can then fire action potentials (either in response to other excitatory inputs or as a result of ‘post inhibitory rebound’). Based on the results, DLM neurons will therefore become activated (and in turn activate LMAN) when the local inhibition in area X (in this case triggered by HVC stimulation at high intensity) lengthens the time period between action potentials in the pallidal neurons. This is consistent with the observation that responses in LMAN could only be elicited by high levels of stimulation in HVC. In this way, an input from HVC sufficient to elicit fast inhibition in area X, removes the veto signal on neurons in DLM, which are then able to discharge and excite LMAN, which can then send the appropriate signals to RA. The short answer is yes. First, the authors showed that although the path-length between HVC-Area X and that of Area X-DLM, are similar the conduction times are much smaller in the latter. This, they suggest, is achieved both by an increase in diameter of the axons projecting from AreaX to DLM, axons which are myelinated even within DLM. The population latency in DLM and LMAN following HVC stimulation is very similar, but the authors argue that perhaps the population of DLM neurons that have the shortest latencies that are the ones that are playing the key role. The specialisations in axonal morphology and myelination of the pallidal neurons may be an evolutionary adaptation that contributes to a short latency pathway that can modulate fine temporal features of song production.